This is a story about a boy and a girl. Meet the girl. She often does this, looking out windows and avoiding eye contact with cameras, giving an elusive yet hopefully intriguing appearance. Girl spots boy. Meet the boy. He wears a yellow rain coat and some people call him "Captain." "So uh, you come here often?" "This seat isn't taken, is it?" 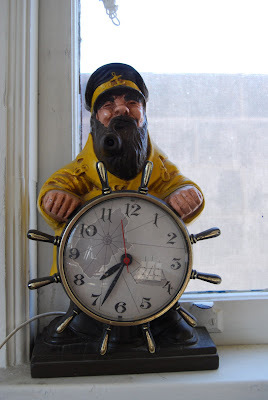 Girl loses interest, because let's face it, sailor clocks are never dependable (he's displayed the same wrong time for as long as she can remember) and he probably won't call anyway. 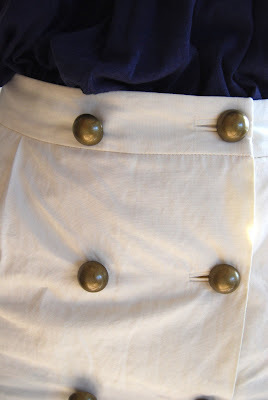 So instead, girl posts close-up shots of her outfit including her new go-to skirt with awesome brass buttons. Hmm. I'm jealous. Wish I had a sailor dude to avoid eye contact with. 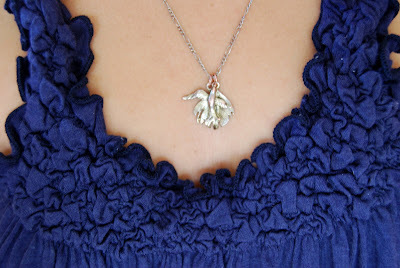 :) Cute post! Gotta love a go-to skirt with fabulous buttons. Thanks! I was in a silly mood when I started putting these photos together. 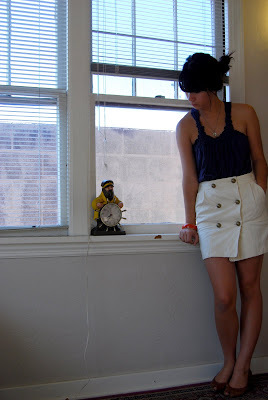 And I just love that clock (and skirt)!